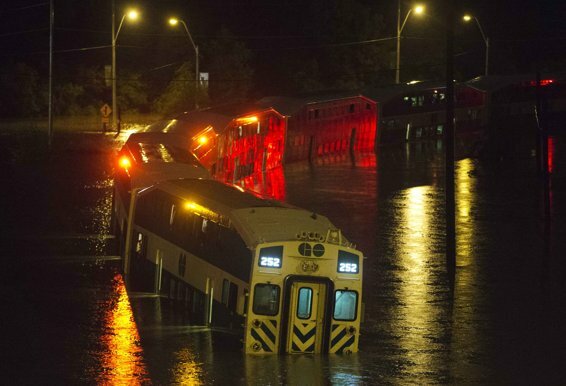 The Greater Toronto Area is in recovery mode today, after record-setting rains swept across the area on Monday evening, putting streets under water, leaving thousands without power and stranding hundreds of people on a GO Train for hours. Monday's rains, measured at 126 mm for the day, set an all-time record for Toronto Pearson Airport, breaking a record that had stood for nearly 59 years. What's more amazing is that this new record was set in just 7 hours, whereas the previous record was set over 22 hours of rain, when Hurricane Hazel hit the city on October 15th, 1954. We had 90 millimetres of rain within an hour and a half at the airport," Environment Canada meteorologist Peter Kimbell told The Canadian Press. "It was a bit of a surprise yesterday," he said in the interview. "The [Environment Canada] warning was actually not issued until the storm had begun." Flooded streets were reported across the metro area, with many streets, including the south end of the Don Valley Parkway, disappearing under water. Many commuters were forced to abandon their vehicles, and hundreds of people aboard a GO Train were stranded for roughly seven hours, as rising waters made it impossible for the train to go anywhere. The rains are continuing today, with showers expected all day and more thunderstorms possible this afternoon.